New certification process shows Canadian Hail Repair has the tools and the talent. The dent is at the very limits of what can be repaired with paintless dent repair techniques, but Yannick Poirier isn’t worried. Years of practicing PDR have led up to this moment, and he’s confident he can repair the dent in the time allotted. When he’s finished, the former dent is invisible to the naked eye. A sophisticated electronic scanning device confirms that the repair is good, and much more: the dent has been returned to within .995 standard deviation from the original. It may literally be the closest to perfection anyone has ever come with PDR. 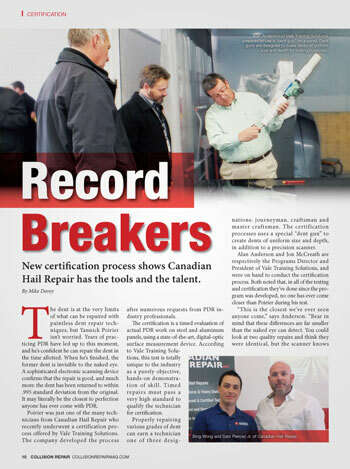 Poirier was just one of the many technicians from Canadian Hail Repair who recently underwent a certification process offered by Vale Training Solutions. The company developed the process after numerous requests from PDR industry professionals. The certification is a timed evaluation of actual PDR work on steel and aluminum panels, using a state-of-the-art, digital-optic surface measurement device. According to Vale Training Solutions, this test is totally unique to the industry as a purely objective, hands-on demonstration of skill. Timed repairs must pass a very high standard to qualify the technician for certification. Climate change is an important agenda item the world over for all levels of government and businesses alike. Insurance companies are particularly concerned with climate change and its impact on extreme weather events such as hurricanes or other super-storms that bring with them torrential rains and heavy snow, flooding and hail stones big enough to damage the shingles on the roof of your home and put hundreds of large dents on every panel of your car or truck. These events used to be few and far between, particularly in Canada, where many of us are fortunate enough to have never experienced the full-force of nature’s mood swings. In the last several years however, Canada has been having its fair share of extreme weather; bringing with it, a number of significant hail events that have resulted in hundreds, thousands and even tens of thousands of home and auto repair claims from a single storm. Paintless dent repair (PDR) has become the preferred repair method by insurers for hail damaged vehicles. In years past it was large American companies that would fly teams of PDR technicians from the southern United States, where hail is more common to service the Canadian market place. In August 2012 Ottawa, Ontario was struck with a freak hail storm that did significant damage to a large part of the city’s east end. 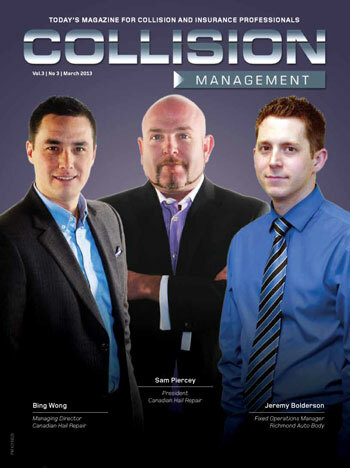 Canadian Hail Repair led the charge working with all of the top body shops, insurance companies and car dealerships. Mark Robinson from The Weather Network and www.stormhunter.ca came to Ottawa and put this piece together to help the people from Ottawa better understand what was going on in the city after the hail storm. We had more than 40 technicians in the city working well into the winter to get everything done… and with rave reviews from all. Copyright © 2015 Canadian Hail Repair Inc. All rights reserved.